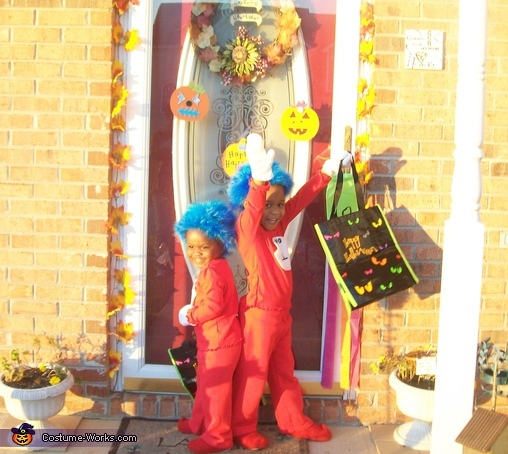 My daughters are Thing 1 and Thing 2 from the Cat in the Hat. The idea came from a friend who overheard me call them #1 and #2. The costumes are homemade. I purchased the red tops and bottoms from a large retailer and cut out a white fleece circle and wrote on each with some black puff paint. I stitched the white mittens by hand as well as the little red fleece shoe covers to make the look complete. The big wig is actually a feather boa attached to a wig cap. Cool costumes!! Perfect for the two little ones. The costumes look very well put together. LaTonya did a great job recreating two of Dr. Seuss' zanier characters. The girls are adorable. Great Job!! You are so cool! How crafty... These are amazing costumes. You know, you're going setting the bar high...what will you do next year?! Fantastic costumes! The best costumes are home-made with love and talented moms. LaTonya is definitely a talented and loving mom. Great job. I love the use of feathers to make the hair. Wish I thought of that years ago. Thanks for the great idea.